Unusually large, inlaid with crystal, amber and silver. Engraved with thistles, inside cover carved 1741, Wilm. Ruthven, WH. Provenance; Fountain Walker collection. Missing pieces of amber etc. Rectangular top with cross banded edge over two over three drawers, raised on bracket feet. Provenance; George Lowcay Norcock a British ship commander. 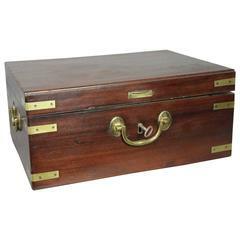 Rectangular hinged top over a conforming case with brass strapping, main fire gilt bail handle with conforming side handles. 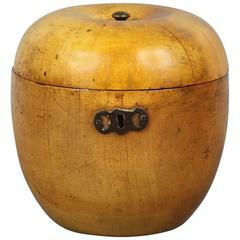 Apple form with lock and finial. The lid incorporating a circular painted panel of a continental harbour scene, under glass, within a gilt metal rope border circular frame, 7cm diameter.